UPDATED: Wed., Aug. 31, 2011, 1:45 p.m.
KILLINGTON, Vt. — Running low on food and money, Vermont residents stranded by flooded roads relied upon provisions dropped by National Guard troops to get by today while the rest of the East Coast labored to recover from the wrath of the hurricane-turned-tropical storm known as Irene. At Killington Elementary School, residents came for a free hot dog and corn-on-the-cob. Jason and Angela Heaslip picked up a bag filled with peanut butter, cereal and toilet paper for their three children and three others who are visiting from Long Island. “Right now, they’re getting little portions because we’re trying to make the food last,” said Jason Heaslip, who only has a dollar in his bank account because the resort where he works hasn’t been able to pay him due to the storm. One flooded Vermont town still remained totally cut off from the outside world today, and National Guard helicopters were still dropping supplies on storm-ravaged parts of the state. In places like Killington, residents were banding together to keep the community functioning. Some volunteered tractors to help remove mud and debris, while those with working electricity were letting neighbors use their showers. Nearly 2 million people remained without power in water-logged homes and businesses from North Carolina through New England, where the storm has been blamed for at least 45 deaths in 13 states. Raging floodwaters continued to ravage parts of northern New Jersey on Wednesday morning, even after the state’s rain-swollen rivers crested and slowly receded. The town of Rutland is 15 miles away but impossible to reach because of extensive road damage. Purohit said the family has power and plenty of food and water to keep them going, but no way of leaving. 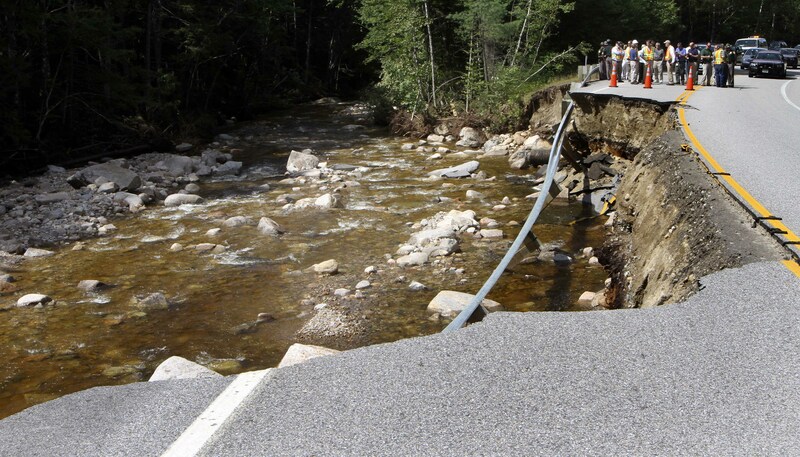 Nearly 11 inches of rain triggered the deluges, which knocked houses off their foundations, destroyed covered bridges and caused earthquake-style damage to infrastructure all over Vermont. “We are dropping water, food and supplies, trying to help out folks who are hurting,” said U.S. Army national Guard Capt. David Fabricius, who was working at an airport in Fair Haven, Vt., where ground crews were loading provisions onto helicopters that recently had flown missions in Iraq. Towns around New Jersey resembled large, soggy yard sales today as residents dragged flood-damaged belongings out onto lawns and into streets still muddied with floodwaters left behind by Hurricane Irene. In Wallington, a heart-shaped, one-square-mile town of about 12,000 residents, large sections remained inundated with floodwaters from the Passaic River, which winds around the small hamlet and hits it from several angles. New Jersey Gov. Chris Christie said Tuesday night that he saw “just extraordinary despair” after touring flooded areas. Irene washed away large swaths of beach along Connecticut’s coast, leaving many residents concerned about ocean water closing in around their property. Emergency orders have been issued to allow coastal residents to immediately repair or shore up areas that threaten properties. The Connecticut River at Hartford crested Tuesday evening at its highest level since 1987, according to Nicole Belk, a hydrologist with the National Weather Service, in Taunton, Mass. But she said levees helped minimize flooding in riverside communities. Vermont’s largest electric utility said a convoy of line crews is headed for the town of Rochester — where a power substation was completely destroyed by flooding — to begin work to restore power. Officials say at least five Vermont schools are closed until further notice and about 120 have delayed opening for the school year because of roads or schools ravaged by flooding. Flood control dams and basins that New England states installed after 1955 floods helped prevent a catastrophe in the lower Connecticut River basin, said Denise Ruzicka, director of inland water resources for Connecticut’s Department of Energy and Environmental Protection. Vermont National Guard choppers made three drops in Killington, Mendon, Pittsfield and Rochester Tuesday while 10 other towns received truck deliveries of food, blankets, tarps and water. Eight Black Hawk and Chinook helicopters from the Illinois National Guard are expected to arrive Wednesday to bolster the number of flights. Volunteers in Windham, N.Y., helped 26-year-old Antonia Schreiber salvage the floors of the 200-year-old cottage she had transformed into a luxury day spa. The ski town, high in the Catskill Mountains, was left under several feet of brick-red water Sunday night after a stony creek grew to a raging river fueled by a foot of rain. During a visit to the Catskill Mountains Wednesday, New York Gov. Andrew Cuomo said he expects damage in the state to total $1 billion. Early today, President Barack Obama declared a major disaster in New York, freeing up federal recovery funds for people in eight counties. Assistance can include grants for temporary housing and home repairs, low-cost loans to cover uninsured property losses, and other programs. Irene destroyed 500 to 600 homes and thousands of acres of farmland in upstate New York. Published: Aug. 31, 2011, 1:45 p.m. Updated: Aug. 31, 2011, 1:45 p.m.